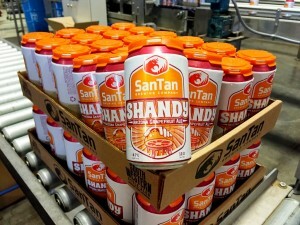 Brewed for the southwest, SanTan Brewing Company’s new spring seasonal beer, Grapefruit Shandy, is a delicious American Ale blended to perfection with locally sourced Arizona grapefruit juice. No artificial flavors, concentrates or extracts are used, just 100% natural grapefruit juice. The aroma is fresh with grapefruit and a hint of malt, perfect for any beer mimosa fan. Get down with the shandy, baby! “Grapefruit Shandy is the perfect new brew for enjoying on a warm spring day over brunch. With its sweet fruit beer characters and citrusy grapefruit bite, our Shandy is pleasurable to the palate and refreshing,” said Anthony Canecchia, founder and brewmaster, SanTan Brewing Company. Available at craft beer establishments on tap and in cans featuring SanTan’s fresh new look, Grapefruit Shandy will be available in Arizona, California, Texas and New Mexico on February 1, 2016. SanTan Brewing Company continues to be one of the fastest growing craft breweries in the nation. In 2015, SanTan unveiled a fresh new look! After eight years of rapid growth and expansion, SanTan has launched a refreshed brand that is fun yet mature, cohesive and visually stunning, a perfect complement to its Southwestern Style Ales. To find a pint or can of SanTan’s beers near you, visit SanTan Brewing Company’s Beer Finder online at www.SanTanBeerFinder.com. Arizona’s favorite craft breweries. In addition to brewing, SanTan features a friendly neighborhood brewpub in Downtown Chandler, which has quickly become one of the top local food and beer destinations in the Phoenix metro area. All SanTan Brewing Company craft beers are Southwestern Style Ales. SanTan’s brews are fermented to completion and carbonated higher than traditional American beers for a more effervescent, crisp and refreshing hand crafted beer – perfect for quenching your thirst in the hot Arizona sun and throughout the southwestern region of the US. SanTan beers have won numerous national and statewide awards including two medals at the US Open Beer Championship: bronze in 2013 and gold in 2011. 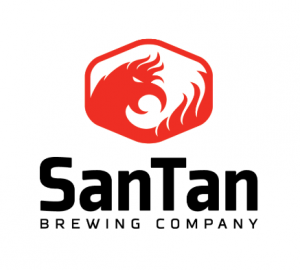 SanTan Brewing also took home a silver medal at the 2011 Great American Beer Festival and won Best Brewery in Arizona, selected by the Phoenix New Times and the Arizona Republic, in 2013 and 2011. Check out SanTan Brewing Company online at www.santanbrewing.com and become a fan on Facebook or follow them on Twitter. ← Previous Previous post: Arizona Beer Week Returns With Events Galore! Next → Next post: Southern Rail Brings NOLA to PHX for Mardi Gras!